From an early age, Carol Stauffer knew she wanted to have a profession in which she helped protect the environment and conserve natural resources. She thought about being a park ranger but eventually changed her mind and pursued a planning career instead. She now has over 30 years of professional planning experience with a focus on municipal planning assistance, environmental resource protection, and infrastructure planning. She has worked at the Chester County Planning Commission for 28 years and was recently promoted to assistant director following the retirement of her predecessor David Ward. Carol said she was very happy to learn that she was named assistant director and that Executive Director Brian O’Leary and the Planning Commission board felt confident that she could take over this role. “I’m looking forward to implementing Landscapes3 and taking on the challenges of my new position,” she said. In addition to supporting O’Leary, Carol hopes she can be a resource to the entire staff because of the different positions she’s held over the years. “I’m looking forward to working with Carol in her new role as we move forward implementing Landscapes3,” said O’Leary, referring to the county’s newly adopted comprehensive plan. Carol landed a job at the Chester County Planning Commission in 1990 as a senior community planner after she worked as a regional growth management coordinator in Maine for a few years. Prior to Maine, she worked for private and public planning firms in Pennsylvania, including three years at the Bucks County Planning Commission. 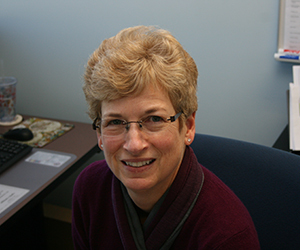 After working as a senior community planner for 16 years, Carol was promoted to Planning Services Division director – a position she held for eight years. In that role, she helped develop the Vision Partnership Program (VPP), which provides funds or technical assistance to municipalities for comprehensive plans, ordinance updates, or planning studies. As Planning Services director, she provided oversight of community, housing, environmental, and historic preservation planning projects with the overall goal of implementing Landscapes, the county’s comprehensive plan. Most recently, she served as the department’s Infrastructure and Plan Review Division director and oversaw plan reviews, environmental reviews, data and demographic activities, and pipeline initiatives (including management of the Pipeline Information Center). Carol has been involved with all the countywide comprehensive plans over the years, including the original, award-winning Landscapes plan, Landscapes2, and Landscapes3. “What really amazes me is how the whole concept of Landscapes has taken hold among municipalities and the county,” she said, adding that Chester County has been at the forefront with helping municipalities implement the county comprehensive plans through VPP funds and technical assistance. 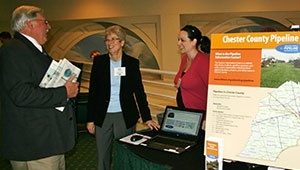 Carol has a certification from the American Institute of Certified Planners and she completed the Chester County Leadership Development Program. She has a bachelor’s degree in geoenvironmental studies from Shippensburg University and a master’s degree in city planning from the University of Pennsylvania. She has received accolades for her work over the years, including an award from the Pennsylvania Chapter of the American Planning Association for the Chester County Pipeline Information Initiative. She also received awards from the national branch of the American Planning Association and the Pennsylvania Chapter of the American Planning Association for her work on the Landscapes VPP and Planning Toolbox. A Lancaster County native, Carol has lived in Chester County for the past 28 years and currently resides in Thorndale, Caln Township. In her spare time, she enjoys hiking in the county parks, walking, reading, gardening, and traveling. Her favorite place in Chester County is Longwood Gardens where she is a member and visits often with her husband Mark, an environmental health specialist for the Chester County Health Department. “It’s an amazing world-class attraction to have in your backyard,” she said of Longwood Gardens. And what’s Carol’s life philosophy? “I always feel it’s good to give people the benefit of the doubt, be objective, and keep your sense of humor,” she said.